Ever since it was discovered in 2004, graphene has been hailed as a natural wonder of the materials world destined to transform our lives in the 21st century. 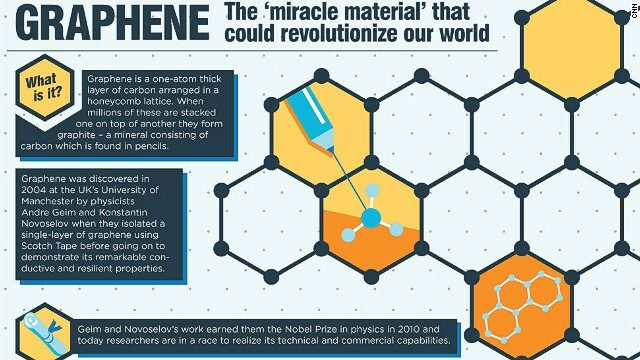 Graphene's amazing properties excite and confound in equal measure. How can something one million times thinner than a human hair be 300 times stronger than steel and 1,000 times more conductive than silicon? CNN Labs asked the head of MIT's graphene research department, Tomas Palacios, to explain why graphene is such a special material and what we can expect it to do for us in the future. One of the most attractive applications for Graphene is Graphene-based transistors! Major companies like IBM are leading that research. Graphene-based transistors have superior switching capabilities (100 GHz) as well as holding more than the two states (0 or 1) of the binary system capabilities than those of semiconductors. They are generally distinct to overweight women in the publish menopausal age. People with pre-current liver issues also have to have to assume twice before using cinnamon complement as high concentration of coumarin can aggravate liver ailments.